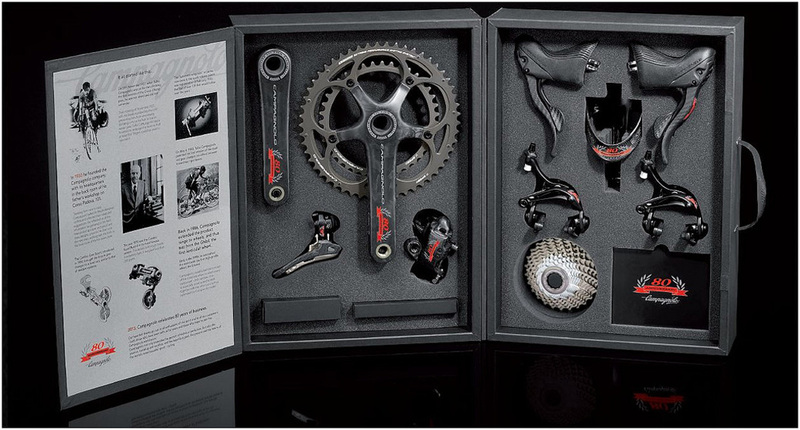 Campagnolo has revealed the 80th Anniversary Groupset. The group is mechanical, has the quality of Super Record level but labeled 80th Anniversary group with a Matte finish. The limited production will be available this spring. There’s also a 80th Anniversary wheelset released by Italian brand. Wheelset has two options: Bora Ultra II or Bullet Ultra, but named “80th Anniversary” with Matte finishing. These can be ordered with the group set or separately. The groupset is 11-speed, crank arm length options are 170mm, 172.5mm and 175mm. Chain ring options are 34/50, 39/52 and 39/53. It is coming with a 80th Anniversary wheel bag. To more photos and buy the groupset, visit Glory Cycles flicker page. Glory Cycles is a Campagnolo Pro shop and all product sold through us is authentic and covered by Campagnolo’s warranty. Campagnolo is an Italian manufacturer of high-end bicycle components with headquarters in Vicenza, Italy. Founded by Tullio Campagnolo, the company began in 1933 in a Vicenza workshop. Tullio Campagnolo was a racing cyclist in Italy in the 1920s and he conceived several ideas while racing, such as the quick release mechanism for bicycle wheels, derailleurs, and the rod gear for gear changing. Campagnolo has been awarded more than 135 patents for innovations in cycling technology. At the end of the 1950s, Campagnolo started to manufacture magnesium parts such as wheels for sports cars like Alfa Romeo, Ferrari, Lamborghini, and Maserati, and built chassis for NASA satellites in 1969. In 1963, Campagnolo produced a disc brake for the Innocenti Lambretta TV motorscooter – the first two-wheel production vehicle with such a brake. In the 1970s they also supplied wheels for Ferrari’s Formula One cars. Campagnolo built chassis for NASA satellites in 1969. 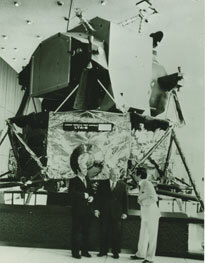 Tullio Campagnolo (in the middle), in front of NASA satellite OSO 6. Campagnolo worked with the manufacturer Colnago and Eddy Merckx, the greatest cyclist of all time, and produced lightweight parts for the bike he used to beat the world hour record in 1972. The Italian brand is the most successful groupset manufacturer in Tour de France history. The brand has focused on road cycling and track cycling. For the 2013 season, Campagnolo is the main supplier of WorldTour teams AG2R La Mondiale, Astana, Lotto-Belisol and Movistar. Update: Campagnolo has launched the website http://anniversary.campagnolo.com dedicated to the 80th anniversary groupset. The website only shows a countdown timer now.